The clues that we find in oral histories, notes on pictures and family bible records are essential pieces of the jigsaw puzzle that we call family history. Your family members whether they are immediate family or distant cousins have been archiving bits of information such as papers, heirlooms and photographs for centuries. You must do your best to find these clues. Family historians must collect, archive and catalog all of these pieces of evidence and compare them with other genealogical records to piece together the puzzle. Writing up the story at every phase of the process is essential for a genealogist whether they are a professional or a hobbyist. Write down the stories that you heard about your ancestors. Then interview or send a written query to everyone you can find that is related to that ancestor through kinship or association. Share the stories with your family and anyone else who is willing to preserve them whether it be an individual, a library, an archive or a website. 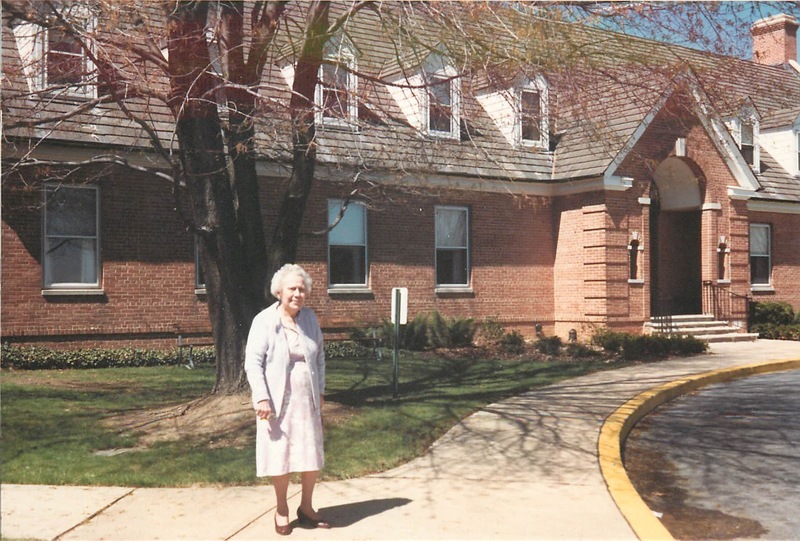 This picture was taken in front of the Methodist Country Home in Wilmington, Delaware in 1990. My grandfather's sister, Aline Mayne Cavanagh, shared her family photo and letter collection with me in 1990. She allowed me to take it home to Reno, Nevada, make copies and return it to her by mail. 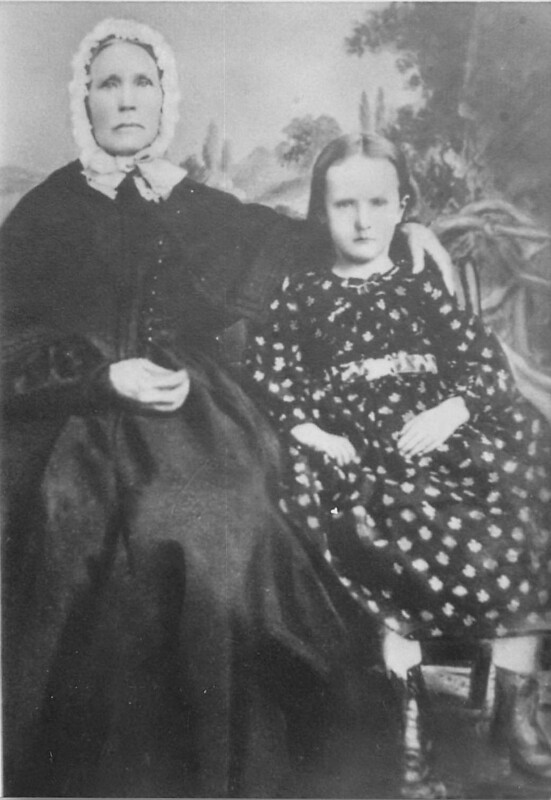 Ann Bamford Nevin 1804-1879 and her grand daughter, Anna Elizabeth Banford Mayne 1860-1938. The girl is Aline's mother and the old lady also known as "Grandma Nevin" is her great grandmother who apparently was visiting her daughter's family near Cincinnati from her home in Schuyler County, Missouri. Taken at J.P. Ball's Photographic Gallery, on 4th St. between Main & Walnut Streets, Cincinnati, Ohio about 1867. 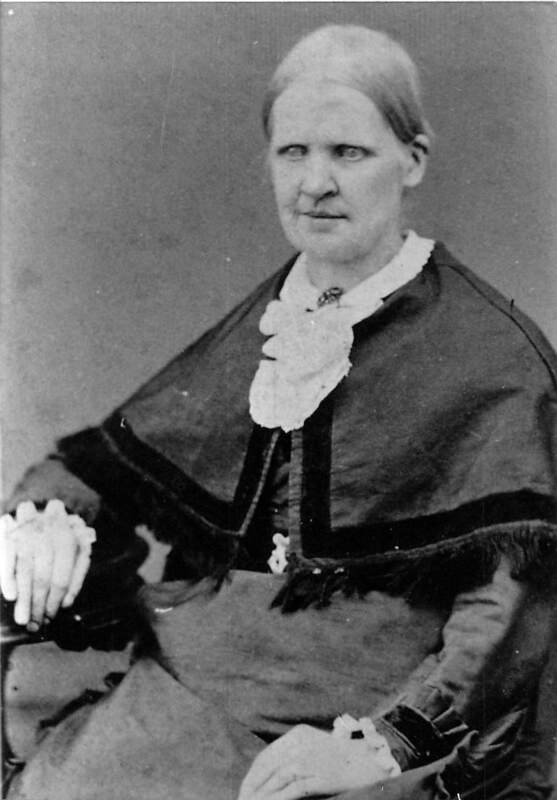 Date is estimated based on an estimate of Anna E. Banford's age at 7. It would be interesting to see if Mr. Ball was listed in the Cincinnati City Directory around that time. One of the pictures was labeled Aunt Margaret Bryant, Grandma Nevin's sister. Another was labeled Will Banford, Billaire. I was able to discover the maiden name of both Grandma Nevin and her sister, Aunt Margaret Bryant, by sharing these photos with a Bamford descendant who I discovered was a distant cousin, Margaret Arthur of Ocala, Florida. Taken by Brown, 1222 Market Street, Wheeling, West Virginia. Labeled as Aunt Margaret Bryant, Grandma Nevin's sister. This photo was in the collection of Aline Mayne Cavanagh, my grand aunt and was copied in 1990. "Bless the gods of genealogy! I despaired of ever seeing a photo of my ggg-grandmother! She has the same jaw as that of her daughter, Mary. And Will! The resemblance is remarkable! I believe that the young man is William of Bohattan, b. 1840--he looks to be about 25 in the photo, doesn't he?--son of William of Ramult, b. 1805, Margaret's brother. Bellaire is in Belmont County, Ohio, just across the river from Wheeling, where his father settled. William's brother, Charles Fitzgerald Bamford, also settled in Bellaire and had a huge family. Yeah, searching my Irish roots, I started with my mom's memories of her gg-mother, Mary Bryans Wiedebusche She believed she came from Ireland about 1850. Well, my initial searches found her born in Canada, along with a slew of brothers and sisters. Then I went looking for information about Mary's parents, where they came from and how and when they got to Canada. Turns out Mom had Mary Bryans's MOTHER's Bible! There wasn't much in there (turns out Margaret Bamford couldn't write), and it leaves me with an irritating mystery. But it gave me the townland where Margaret was born--Ramult. 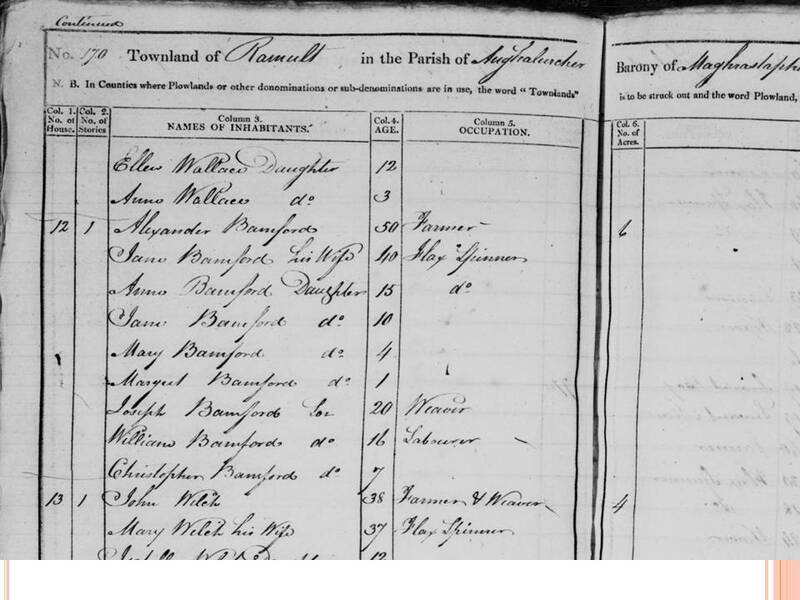 Census fragments from 1821 of Ramult, in Fermanagh, show the entire Bamford family. The Bible gave only three birth and death dates, those of William I Bryans, Margret Bryans, and a daughter, Maggie Brynes. 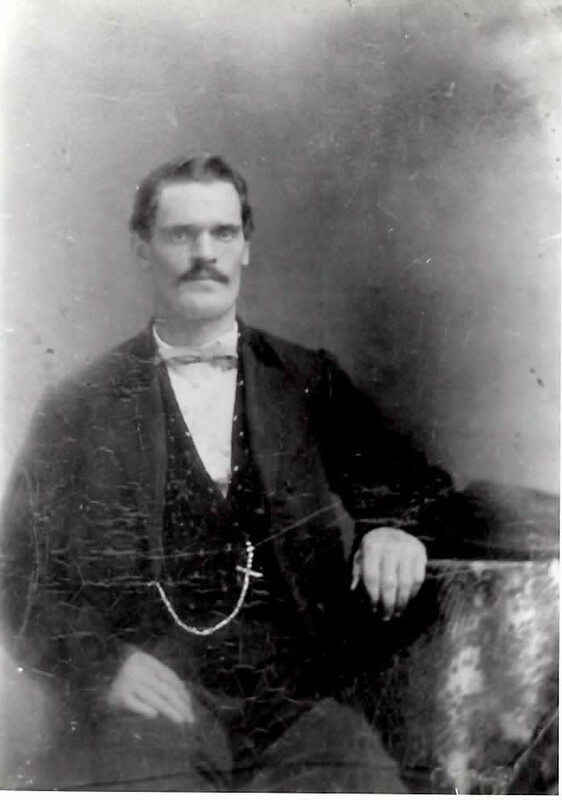 When I found Joseph Bamford in Belmont County, Ohio, I also found his brother, William, across the river in Wheeling, WV. I realized then that this was why William Bryans uprooted his family from Canada in 1865 and relocated to Moundsville. If you go to the 1850 census of Belmont County, you will find living with Joseph one Thomas Navin with his wife Ann and a 4-year-old Magdalina, born in Ireland." 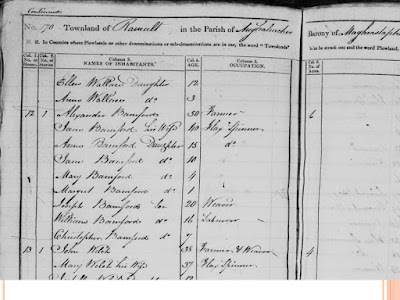 The fact that a picture of Grandma Nevin's sister was passed down in our family labeled Aunt Margaret Bryant and the fact that Margaret Bryant's maiden name was Bamford, helps us to conclude that Grandma Nevin was the Ann Bamford who is enumerated in the 1821 census of the Townland of Ramult. Family of Alexander and Jane Bamford is listed. Several of these children settled in Missouri, Ohio and West Virginia. Margaret Arthur helped to establish that the picture of Will Bamford of Bellaire, Ohio was a nephew of Grandma Nevin or Niven as it is spelled on her gravestone. This photo was in the collection of Aline Mayne Cavanagh, my grand aunt. She allowed me to borrow it and make a copy in 1990. The back was marked: "Will Banford, Billaire" [sic] She resided in Wilmington, Delaware until her death in 1995. The original is in the possession of one of her descendants, hopefully. 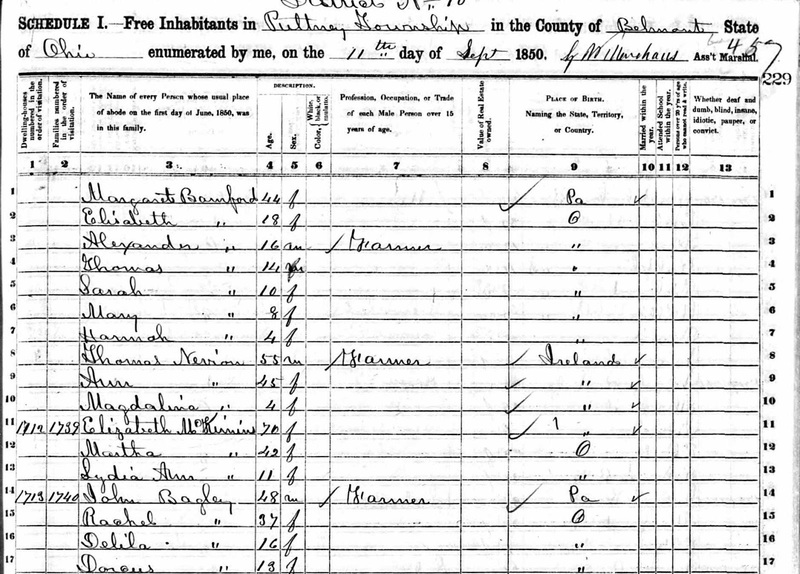 The other piece that helps to support the connection between the Bamfords and the Nevins is the 1850 census record which shows them living together in the household of Joseph Bamford in Belmont County, Ohio. 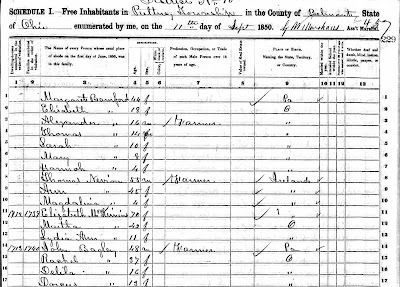 1850 Census Pultney Township, Belmont County, Ohio showing the family of Thomas and Ann Nevin residing with Ann's brother, Joseph Bamford. Joseph Bamford is listed on the bottom of the preceding page. 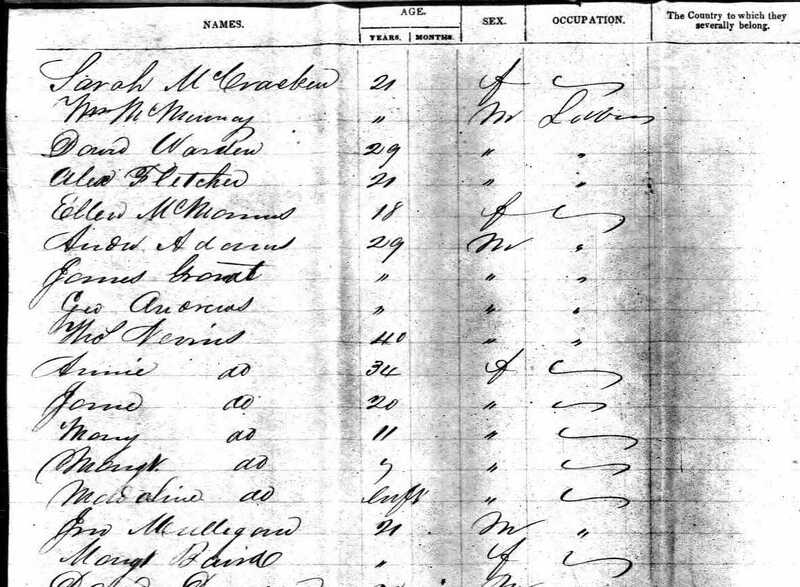 Margaret Arthur had questioned the connection because the September 1850 census record shows Magdalina as age 4 which conflicts with the May 1850 passenger list for the Wolfville which shows Magdalina as "inft" which is presumably an abbreviation for infant. If you look at the 1860 census of the Nevins in Schuyler County, Missouri you will see that Magdalina is listed as 14 which would coincide with the age of 4 in the 1850 census. So it appears that the age of Magdalina on the passenger list was inaccurate. One mystery that remains is the location of the other daughters in the 1850 census. 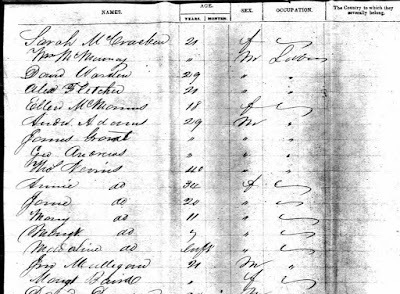 Passenger List of the Ship Wolfville arriving in New York harbor 23 May 1850. Passengers include Thomas Nevin and his wife, "Annie" nee Ann Bamford and their daughters, Jane, Mary, Margaret and Magdaline. The story that has emerged by assembling all of these puzzles pieces tells of the process of chain migration from Ulster. A large extended family of Bamfords and Nevins all immigrated from County Fermanagh, Northern Ireland. Their descendants are now scattered across Ireland, the U.K., the U.S., Canada, Australia and South Africa.